It’s “Brooklyn in the House” !! For all the 80’s and 90’s babies out there, we’ve long known that Brooklyn may be the hippiest borough in NYC. Home to over 2.6 million New Yorkers, Brooklyn is the most populous city in the boroughs so it’s no wonder more and more people are choosing to get hitched here! Couples are saving $40,000 or more by choosing an affordable wedding venue in Brooklyn compared to getting hitched at a Manhattan wedding venue (the average cost for a wedding in Manhattan is around $80,000). Given it’s easy access from the other boroughs, its’ diverse wedding venue options , waterfront locations and skyline views, Brooklyn is the best choice for couples on a budget or any engaged pair that wants a unique wedding venue without breaking the bank! If you want an all-inclusive option in Downtown Brooklyn, Deity Events may be the right choice. 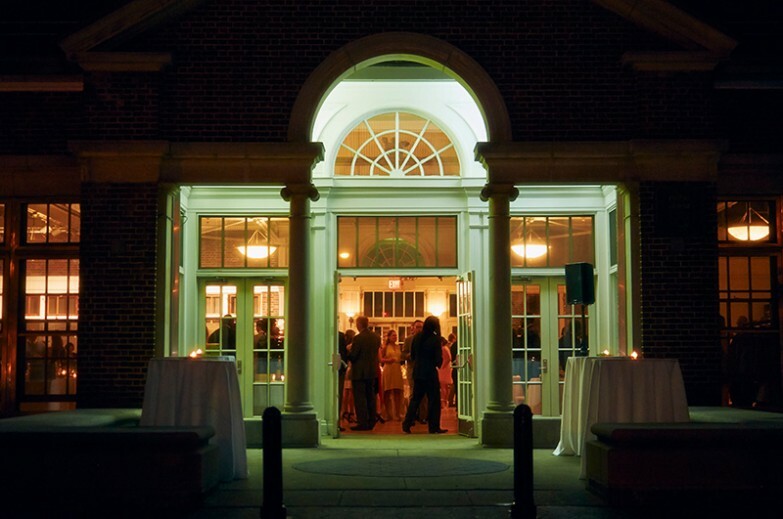 One of our favorite venues, the 4-level Synagogue-turned nightclub- turned wedding venue, offers creative couples several levels of unique space to host their big day. One of the few rooftop venues in Brooklyn, Deity offers couples a stunning Bridal suite with access to a private rooftop and outdoor jacuzzi! 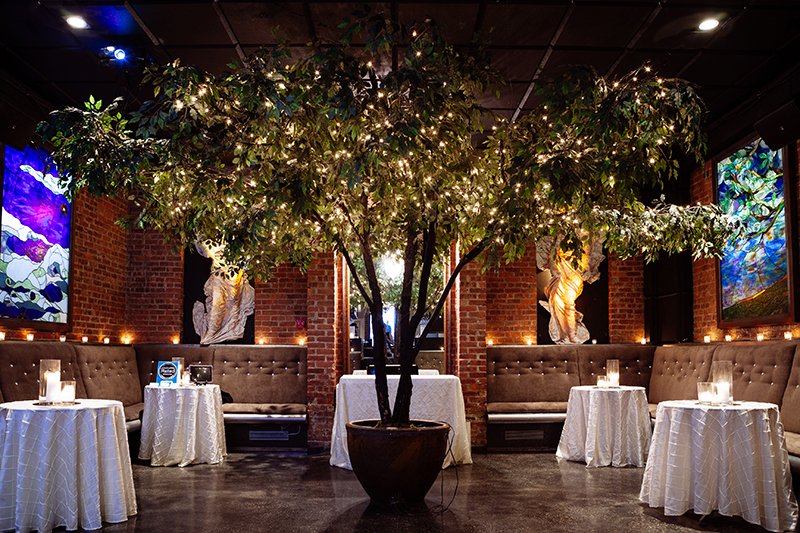 One level down, you will find a beautiful loft space perfect for your ceremony followed by a unique lounge with a one-of-a-kind floor to ceiling “tree of life” draped in lights! When the party gets started couples and their guests head down to a fully renovated cellar equipped with state of the art sound system! Deity takes care of all the details and their package includes exclusive use of the space in-house catering and a DJ! Add in our affordable wedding photo, video and photo booth package and you are all set! Be sure to check out one of our beautiful Brooklyn weddings at this venue that was featured in the Wedding & Lifestyle Trends magazine! 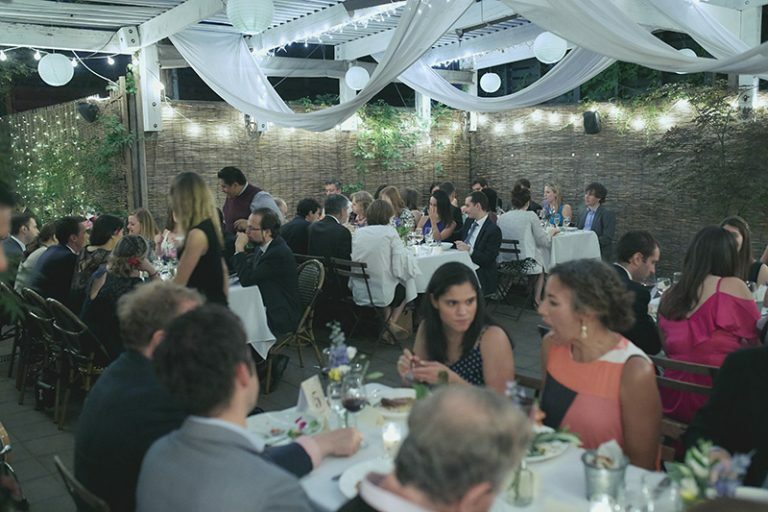 Perfect for intimate weddings, Maison May (formerly ICI restaurant) is located in the Clinton Hill section of Brooklyn on Dekalb avenue. Owned and operated by a French chef, Maison May offers couples an affordable venue option with indoor and outdoor space for your big day. Our photography team love working here and always capture amazing photos! 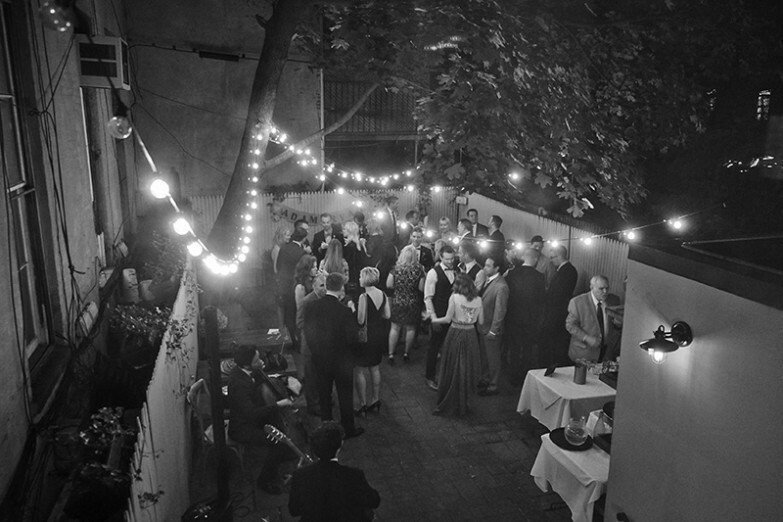 The unique Brooklyn venue offers a Parlor floor that accommodates up to 50 people, a garden wedding reception option in a private outdoor space and ground level restaurant event space for larger crowds. The wedding package includes brunch, lunch and dinner menus with all-inclusive and a’ la carte options as well! The venue is within close proximity to Brooklyn Bridge Park for couples who want waterfront photos before the wedding. Be sure to stop by for their Sunday Brunch to see just how beautiful this affordable venue is! 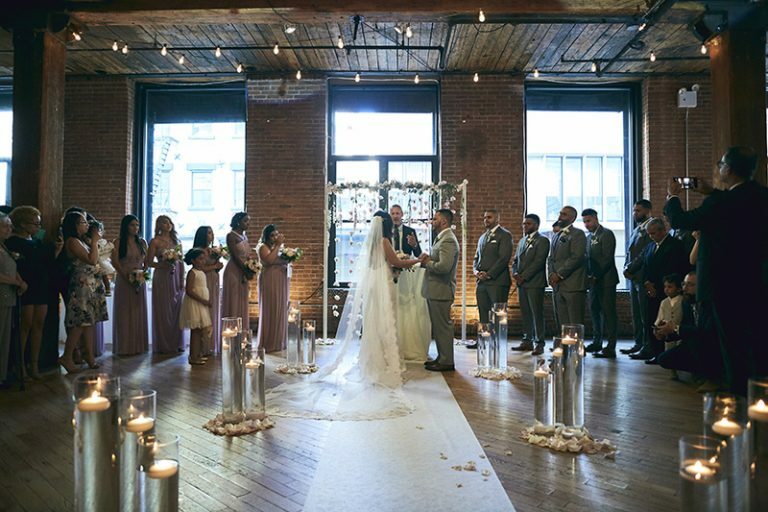 Another French-inspired affordable wedding venue in Downtown Brooklyn, Bacchus Bistro and Wine Bar offers all-inclusive options for your Brooklyn wedding. The staff is amazing to work with and pay close attention to details making sure your big day is perfect! Our photography and video team have shot at this intimate restaurant wedding venue several times and are never disappointed! The venue offers an outdoor space for your ceremony and exclusive use of the restaurant for your reception. The pricing is flexible and the staff work closely with you to create a menu that is both delicious and affordable! If you want even more flexibility in your budget when choosing an affordable Brooklyn Wedding venue, consider a raw space. For a small fee you can rent the beautiful spaces below and choose your own vendors like catering, DJ and affordable wedding photography packages to save even more! For less then $5000 you can rent the Dumbo Loft in Brooklyn, only steps from the waterfront! Whether you choose to host your ceremony in the unique venue or get married on the “beach” in Brooklyn Bridge Park, your photos are sure to be great! Dumbo Loft offers couples a raw space featuring exposed brick walls and floor to ceiling windows. The affordable rental price get you 14-hours in the venue and you are allowed to bring in any vendors you choose. Consider a cocktail style reception or buffet options to make it even more affordable! Dumbo offers amazing backdrops from views of the Manhattan skyline to industrial settings with cobblestone streets and graffiti walls! A photographers’ (and creative couples’) dream come true! 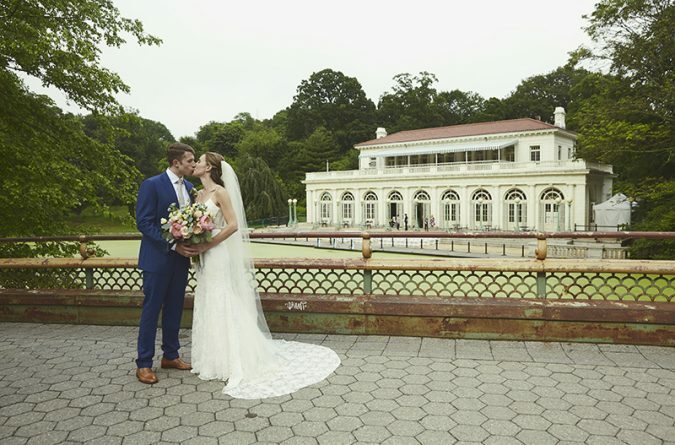 If you are seeking a park setting, The Prospect Park Picnic House offers Brooklyn couples an affordable raw space option with access to over 500 acres! Starting at $4000 couples can rent the Picnic House and choose from the venue’s list of exclusive caterers. Our photography studio is listed on their preferred vendor list and have shot at the Brooklyn venue many times! Couples can get married in an outdoor wedding ceremony in the park right behind the venue or move it indoors in the winter and enjoy the beautiful working fireplace as a backdrop for their wedding photos! Be sure to check out our article on the best unique wedding venues in Brooklyn for even more options!